Trumpeter Swan experts and enthusiasts from all regions of North America will soon convene in Montana. 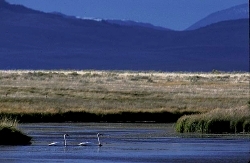 The final agenda for The Trumpeter Swan Society’s upcoming October 10-14, 2012 conference, in Polson is replete with experts on topics ranging from lead poisoning issues to genetic viability to recent results of the 5-Year 2010 Trumpeter Swan Survey. Find a list of speakers and topics on the Society’s website. Dale Becker, TTSS Board President and biologist with the Confederated Salish and Kootenai Tribes (CSKT), and Steve Lozar, CSKT Tribal Council Member will lead off with opening remarks, and a welcome to the Flathead Indian Reservation, co-sponsors of the Conference. Speakers scheduled for the October 11th, Tuesday morning session will provide an overview of Trumpeter Swan population and issues, including an update on the 2010 North American Trumpeter Swan Survey. John Cornely, Executive Director, will describe the Society’s past, present and future, before kicking off an in-depth session on the pressing issue of conservation of Greater Yellowstone’s flocks. Susan Patla will speak Trumpeter status in Wyoming; Adonia Henry and Ruth Shea will discuss strategies for long term viability of Idaho’s Trumpeters. Gary Ivey, Board Vice President, will then chair a dynamic panel of experts including William Smith (USFWS), Rob Cavallaro (IDFG), J. Michael Scott (Univ. of Idaho), Jim Roscoe (Centennial Valley Assn. ), and Kyle Cutting (USFWS). After lunch, the agenda focus will be on Trumpeter Swan restoration efforts and genetic implications of programs, past and present. Several Montana projects will be featured by Janene Lichtenberg and Dale Becker (CSKT) and Clair Gower (MFWP), as well as an update of the Oregon program by Gary Ivey, and an overview of the situation for Trumpeters in Yellowstone, presented by Douglas W. Smith (NPS). Capping this session will be a talk by genetics expert Sara J. Oyler-McCance (USGS). The afternoon will conclude with a session on managing for long-term viability, bringing in lessons learned from Greater Sage Grouse management, presented by Edward O. Garton (Univ. of Idaho). Effective use of partnerships to accomplish goals for viability will be discussed by Dan Casey (American Bird Conservancy), with the afternoon session concluding with a panel and group discussion on a long term conservation vision for Greater Yellowstone. 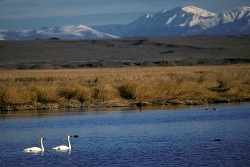 Wednesday, October 12th is slated for an all day field trip to highlight Trumpeter Swan Restoration on the Flathead Indian Reservation, with visits to Pablo NWR, Ninepipe NWR and the Blackfoot River Valley to hear more on northern Montana’s efforts. 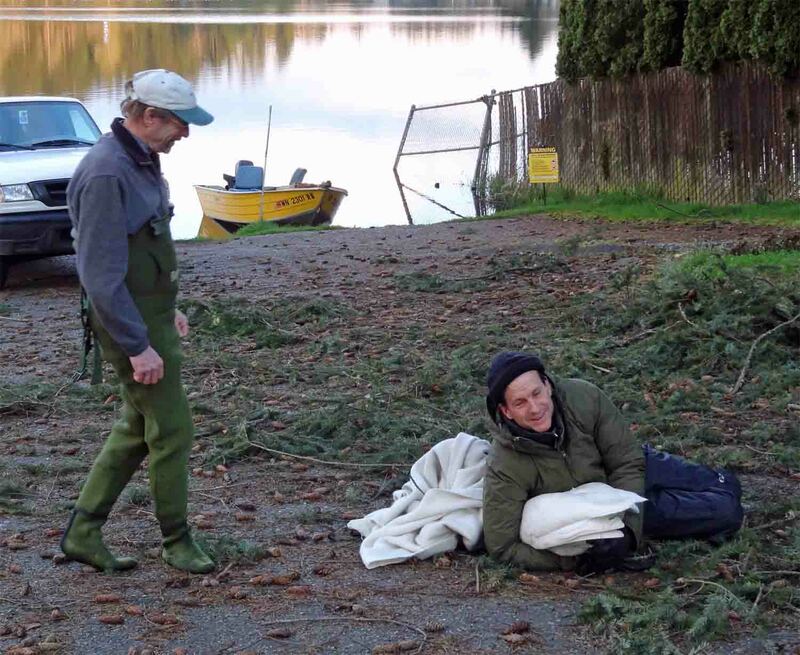 That evening, filmmakers Steve and Char Harryman seek input from conference participants as they begin a five-year project to tell the remarkable story of the Trumpeter Swan. Thursday, October 13 promises to be a full and exciting day. The morning sessions will feature updates on the Pacific Coast Population in Alaska and Canada. Board member Jim Hawkings will chair reports from Deborah J. Groves and John I. Hodges (USFWS), William Quirk (Anchorage), Karen S. Bollinger (USFWS), and Board member Jim King. After a break, Board member Joe Johnson chairs a session on Trumpeter Swan research; speakers include: Jim Hawkings (CWS), Harry Lumsden (TTSS Board, Ontario), Kyle Cutting (USFWS), and Mike Smith (Univ. 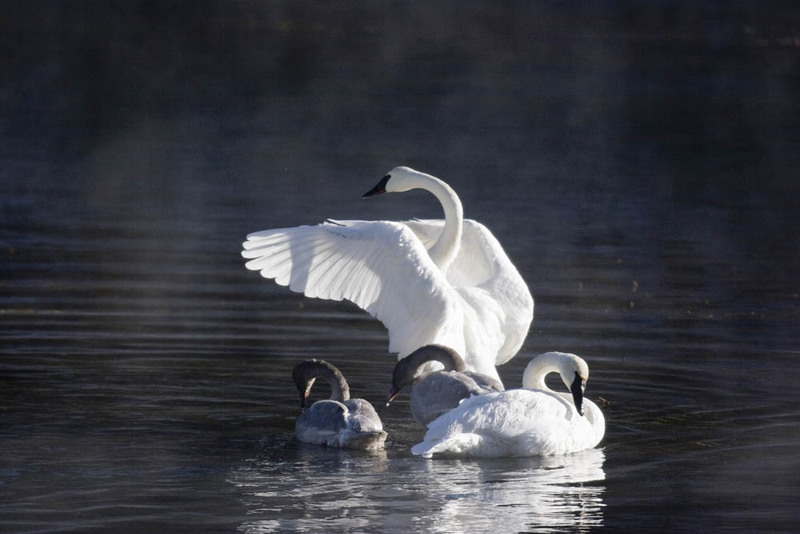 of WA), who will address issues of lead shot poisoning in swans. Topics after lunch hone in on the remarkable restoration of Interior populations, chaired by Ron Andrews, TTSS Board member recently retired from Iowa DNR. Speakers include Joe Johnson (TTSS Board, Michigan State Univ. Kellog Bird Sanctuary), Larry Gillette (Three Rivers Park District, MN), Wayne Brininger (USFWS), Dave Hoffman (IDNR), and Harry Lumsden. The final session prior to the Thursday evening banquet is chaired by Becky Abel, TTSS Board member, wrapping up the conference with a focus on managing Interior and Pacific Coast populations. Shilo Comeau (USFWS) will speak on the High Plains flock, and Roger Grosse (USFWS) will discuss landscape-level habitat use in the Sandhills of Nebraska and South Dakota. All speakers and participants have a special treat in store, learning about George Melendez Wright, a pioneer for Trumpeter Swan Conservation, in the key note address given by Jerry Emory of the California Parks Foundation. Mr. Wright’s great influence on science-based wildlife management in our National Parks was prominently featured in the Ken Burns historical series on our nation’s parks. Participants staying on through the 14th are invited to join informal field trips to wildlife-rich areas in and around Polson. Registration remains open and can be done online, or by contacting the Society’s Executive Director, John Cornely (303) 933-9861 johncornely@msn.com. Details on the conference hotel and specifics can be found on the Society’s website. Photo by TTSS member, A. Frederickson. 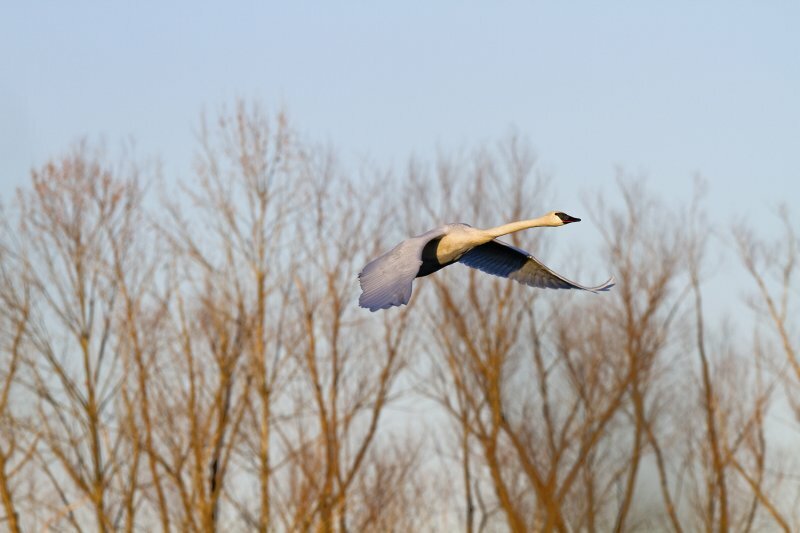 LITTLE ROCK – The Arkansas Game and Fish Commission is asking the public to help with a project by reporting trumpeter swans “summering” in Arkansas. As part of the Mississippi Flyway Council’s Trumpeter Swan Migration Experiment, 49 trumpeter swans were released in Arkansas during the winters of 2008, 2009 and 2010. 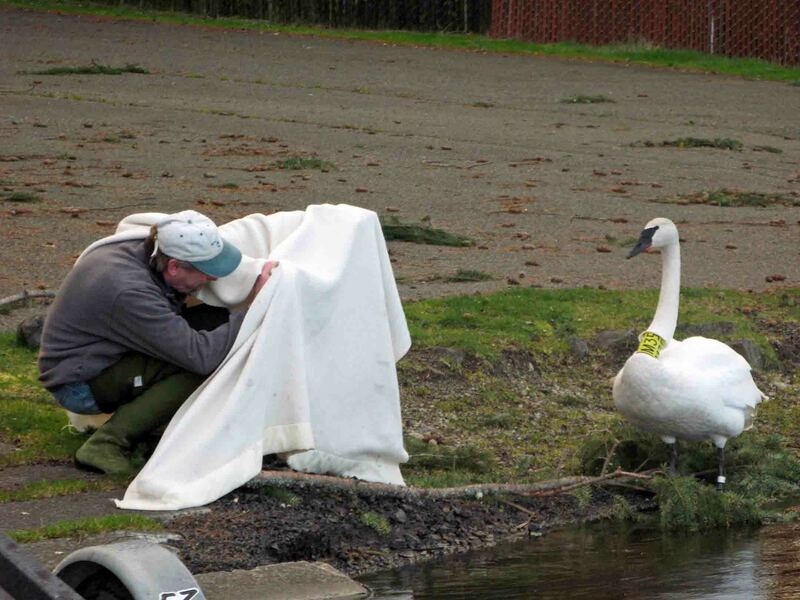 This experiment attempts to re-establish historic swan winter migrations south into Arkansas and other southern states from the swans breeding areas in northern states. Karen Rowe, the AGFC’s Bird Conservation Coordinator, said she is pleased that the majority of the released swans have returned north during the breeding season and many of them have returned to winter in Arkansas. “We have found that a number of our released swans have stayed in Arkansas during the summer and we want to identify and track these birds. We are interested in gathering information on these “summering” swans in order to evaluate the progress of this experiment and track the habitat preferences of these birds,” she explained. Observers should note the exact location of the swan, using a GPS when possible, and report the location, the collar color and alpha numeric code to Rowe at krowe@agfc.state.ar.us or by using the link to the AGFC survey form at http://www.agfc.com/species/Pages/TrumpeterSwanRestoration.aspx. Observers without internet access can report their sightings by calling toll free 877-873-4651. Before European settlement, the breeding range for trumpeter swans encompassed over half of North America, including the northern portion of Arkansas. Commercial harvest of the birds for feathers, skins and meat extirpated trumpeter swans from almost all of North America by the late 1800s. 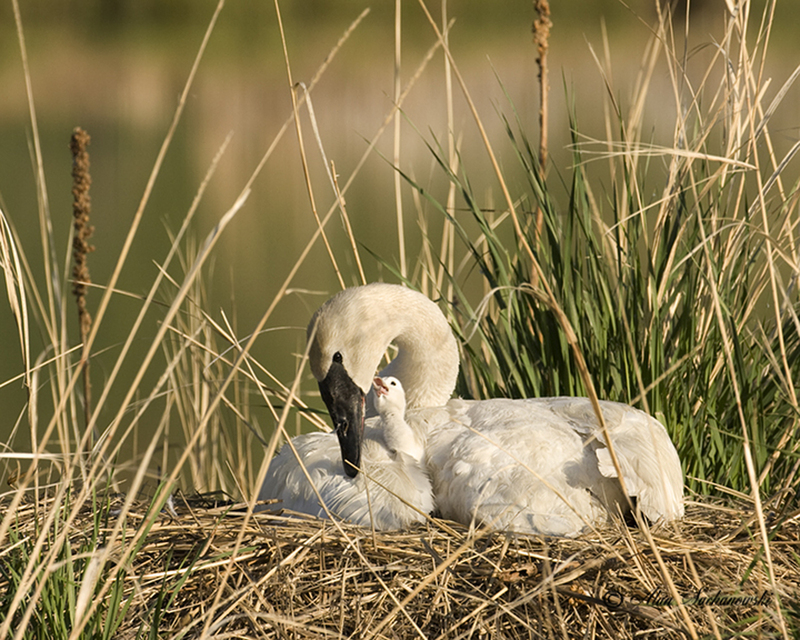 Reintroduction efforts have restored trumpeter swans to portions of their former breeding range. 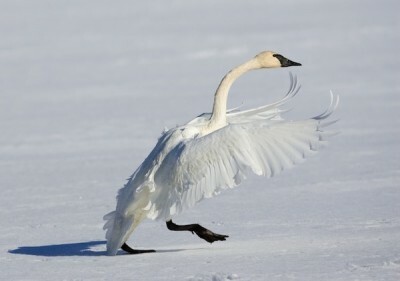 Today, approximately 5,000 trumpeter swans live in the Midwest area of the United States. Trumpeter swans may form pair bonds as early as their second summer, but typically do not breed until they are 4-7 years old. Trumpeters migrate in family groups and prefer to feed on aquatic vegetation. Trumpeter swans are the largest birds native to North America. Adult males measure 57 to 64 inches long and weigh around 25 pounds. Adult females range from 55 to 60 inches and weigh approximately 20 pounds. Their wingspans can approach 8 feet, and they fly with their extremely long necks outstretched.